Receive a Free TONI&GUY cloth tote bag with the purchase of this product. 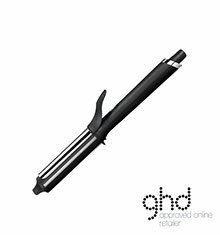 Introducing the latest addition to ghd’s range of tongs and wands, the ghd Curve®. This wand contains the break-through ultra-zone technology that guarantees the perfect curling temperature of 185°C. With this temperature maintained throughout the whole barrel, it ensures the delivery of lasting curls that are formed fast and stay locked-in, while respecting the health of your hair. 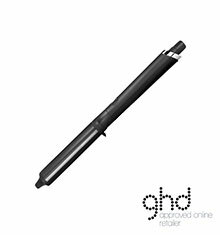 The ghd Curve® Creative Curl Wand has a 28mm-23mm tapered barrel designed to create everything from natural waves to big voluminous curls. The specially designed advanced ceramic coating ensures smoother curling. Benefits include a protective cool tip providing you with a safe place to hold whilst styling, a safety stand which securely holds the tong and an automatic sleep mode which activates if the wand is idle for 30 minutes. The professional length swivel cord allows for flexible styling and the universal voltage ensures that you’ll get the same styling performance wherever you are in the world.